Looking for private in-home or in-studio Opera Voice lessons? Our Washington Navy Yard teachers are ready to get you started. Find your teacher today! This is my specialty! I currently perform at opera houses all over the US, and can help you begin your classical journey, or for the more advanced student, prep audition repertoire and work hone technical skills. Having had the training to sing Opera and performing in them, I understand how that is supposed to work and the amount of breath control that you need to do it well. If you are a beginner we will start off small and work our way up and if you and more of an intermediate singer, we will see how much farther we can get you to go. As a voice teacher and voice coach, I strive to help the student get to where they want to be vocally. For me, singing is something that brings me joy and I hope to be able to share that with you. It took me a while to realize how much music and singing means to me. While studying something entirely different at the University of Maryland, I began studying voice and realized that it was something that I had a gift for. I fell in love with singing art songs, jazz, and opera arias. And while studying at the University of Maryland, I had the opportunity to work as a voice teacher/ section leader with the women's section of a choir, numerous opportunities to work as a soloist and in a few jazz clubs. I was also involved in dance performances and acted as a dance tutor. ity to sing in Little Shop of Horrors and to sing with a women's choir. While studying at the University of Colorado Boulder I began to come into my own and started to let my large sound free. (Which for me was a process. Getting your voice where you want it and to where it is capable is work. But, it is fun work and you're always happy when you have these great moments where you get to where you were hoping you could and that your teacher said you would go at some point.) It was there, at CU Boulder that I got the opportunity to start singing in operas. While in Boulder I sang in The Magic Flute, Sarah McKinnon and as a soloist or recitalist. Also, while there I worked as an actress in a theater company called the Interactive Theater Project for three years. I thought that by getting involved in that that I would be able to act more effectively while singing. It was fun just doing something where you're just working with the spoken word. I had a wonderful time with them and learned a lot about character work and what it takes to connect to the words in an effective way. sang in Ragtime and sang the role of the Wardrobe in Beauty and the Beast. I am currently working as a soloist, a children's choir director, a chorus member, the director of a recital series, a cantor, and I'm writing monologues and small plays to be performed. I was working as a co-executive producer/casting director for a show that is on Amazon Prime as well. I look forward to what the rest of the year will bring. If you're a beginner, I will help you to understand what you need to get through the vocal line with breath and intonation. We will begin by doing vocal exercises and learn a lot about breathing for singing. I want to help you to make more beautiful tones. I will also slowly begin teaching you how to read sheet music and to help you be a more effective listener when it comes to music. I can also help you to become a better communicator as a singer. For acting, I will help you to learn how to develop characters and bring the writer's words to life. We will begin by seeing what sort of subjects or genres interest you and what you are doing with those words now, and how you can delve deeper into making the world of the characters something more flushed out. For beginning piano: I will teach you to learn how the piano is set up, teaching you to read sheet music, beginning theory and to play songs. Something beyond nursery rhymes. Inside my home studio, I have music, a music stand, chairs, WiFi, a computer, a laptop, a keyboard, a microphone, a metronome, a microphone, an amp/large speaker, and a sofa. For voice, I would say that my focus is on classical voice. I also sing jazz, gospel and musical theater. For acting, I have done both improvisational and regular scripted plays. I have taught students with special needs, and as someone with a twin sister with special needs, I am open to teaching students with special needs. She was very informative and very sweet with her honesty. Due to the background she has, her words are extremely dependable. DRAMA! Yes this is all about drama while you sing. Beginners must learn the technique to project the voice in large spaces. Demanding style of singing. You must know your voice to begin to learn operatic roles for you.This is a highly specialized art-form. History of composers and their Operas. How to tell a story through the beauty of song. No compromise. As a graduate student of General Music Education, I have access to a number of performing opportunities including opera, recital, vocal solo class, master classes, and studio classes. The voice and opera program at my private music studio offer students a variety of course offerings that promote a strong technical and pedagogical foundation. 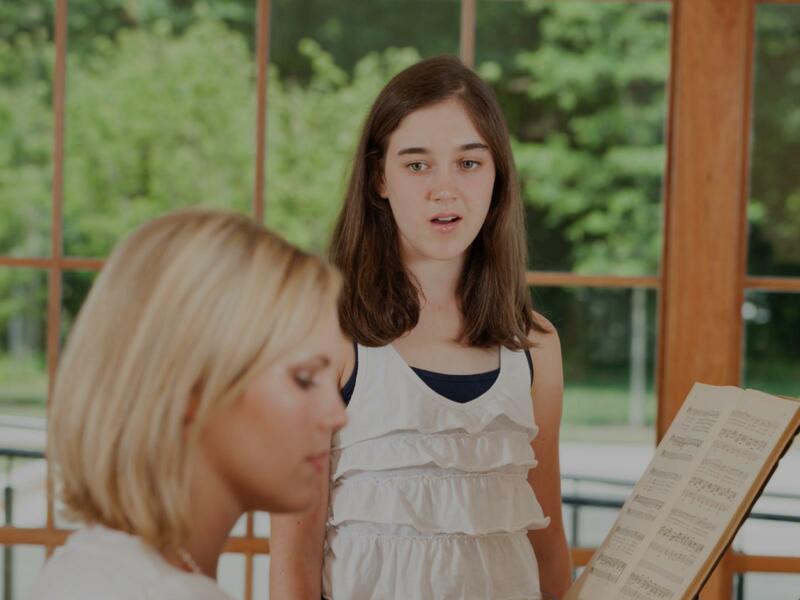 Students receive weekly vocal instruction and, in addition, a weekly musical preparation sessions with the vocal coach. "Great instructor, he has an excellent teaching style." o share them with her students all combine to make her an outstanding artist and teacher. I significantly benefited from my lessons with her!" Washington, DC teacher: Yulia P.
s to build a solid foundation of a vocal technique. Furthermore, she is able to demonstrate and reinforce important points with her own voice and that helps a lot. I definitely recommend Yulia as a voice teacher!!" e. Christine is an amazing vocal coach I would recommend to everyone." Washington, DC teacher: Christine P.
"I had an exciting, fun, very educational first lesson with Christine. I can’t wait for the next one!" pinpoint issues and rectifying them using different techniques to attain correct voice. For a complete novice in singing, I have learned a lot in a very short period, thank you Yulia. I highly recommend her."